The second day in Dry Creek started with an epic bike ride up to the Rockpile AVA, high above Lake Sonoma. That afternoon, I had several appointments lined up thanks to the fine people at McCue Communications. The first was Unti Vineyards. When I was getting ready to head out to my few days in Dry Creek Valley, I told a couple of my wine drinking buddies, and they were certainly envious. A few of them, even gave me some suggestions of wineries to visit. There were a couple wineries that came up, and one was Unti Vineyards (the other was The Vineyard of Pasterick). I had tried some Unti before (a Syrah that a friend brought back from the winery), but given the state of the market here in Pennsylvania (and Unti’s small production–about 8,000 cases a year), there really is not much opportunity to get my hands on their wine. (Before you say I could just order some from the winery, the lovely Commonwealth of Pennsylvania strictly forbids that sort of free market activity.) I also knew that they focused on Mediterranean varieties (French, Spanish, and Italian with some Zinfandel thrown in), and in this age of what seems like steadily increasing prices, their wines would be considered moderately priced given the quality. So when I saw “Unti Vineyards” on my itinerary, I was very excited to stop by. I had three appointments that day and while the other two were 90 minutes each, the Unti stop was only slotted for 45 minutes. I got there on time (pretty much) and sidled up to the tasting room bar. There were already two couples there tasting, and Mick Unti was behind the bar, serving wine and telling stories. Within about five minutes, it was clear that I was going to like Mick–he was gregarious and ebullient–bouncing back and forth between the couples, spinning yarn after yarn. I had a host of questions to ask, but there was really no time to do so. It turned out that Mick needed to head out early to go to his daughter’s track meet (he did not seem to be quite as concerned with the fact that he was getting married in ten days). As I sat there, trying to figure out how to squeeze a question or two in, I realized that it was perhaps better to just sit back and observe. I figured that this was more than likely what Mick’s life was like: entertaining people, selling his wine, running off to a family obligation–in the end, although my stay there was brief, I felt like I got a pretty good glimpse of life at Unti. 2012 Unti Vineyards Cuvée Blanc: Retail $25. 46% Vermentino, 43% Grenache Blanc, 11% Picpoul. The fact that this wine has even a bit of Picpoul made it one of my favorites. Picpoul is relatively unknown outside the South of France, but it fits in well here, giving this wine a boost of acidity and some aromatics. The blend works seamlessly and has you reaching for more (which is what I did when Mick was with the other couples). Very Good to Outstanding. 89-91 Points. 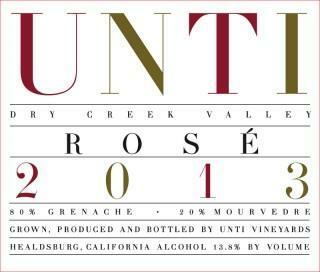 2013 Unti Vineyards Rosé: Retail $23. A pale salmon, this wine is made in the Provençal style (I immediately thought of Bandol), with a Grenache emphasis (80% Grenache, 20% Mourvèdre), quite floral on the nose with ample fruit on the palate. Completely dry, with great acidity, this works on the patio, at the pool, or on the picnic table. Very Good. 89-91 Points. 2012 Unti Vineyards Barbera: Retail $30. Mick was very excited about his Barbera, which was a bit dark in the glass. A bit of fruit upfront, on the verge of big and jammy, with acidity off the charts. I was looking around for a bit of Bolognese, but there was none to be had…. Outstanding. 89-91 Points. 2010 Unti Vineyards Zinfandel: Retail $28. 77% Zinfandel, 17% Petite Sirah, 4% Mourvèdre. Not a big heavy wine–it was brilliantly translucent, great berry fruit but a bit hot on the nose (14.2% abv). Great fruit and spice on the palate with near perfect balance. I think this is exactly what I want in a Zin–this is likely age able for some time. Outstanding. 91-93 Points. 2011 Unti Vineyards Segromigno: Retail $28. 70% Sangiovese, 30% Montepulciano, named after the village in Tuscany where his father was born. The nose on this wine was certainly a departure from the others: more tobacco and earth, with a bit of gaminess thrown in. Whoa. Big and meaty with some underlying fruit and mocha thrown in for good measure. This is a fun wine that would pair marvelously (shameless plug alert) with my carbonara. Outstanding. 90-92 Points. 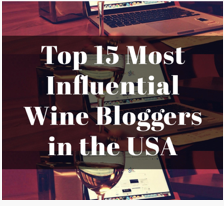 This entry was posted in Barbera, Dry Creek Valley, Grenache Blanc, Montepulciano, Picpoul, Rosé, Sangiovese, Vermentino, Wine, Wine Tasting, Zinfandel and tagged Dry Creek Valley, Mick Unti, Unti, Unti Vineyards, Zinfandel. Bookmark the permalink. I think they really do a nice job. I also think they could likely charge more (and get it), but it seems as though the father brought over his more modest pricing philosophy from the old world. I’ve always enjoyed Unti wines since we first tasted there with Mick. Does he still pour in the barn behind the house or does he have a more formal tasting room at this point? No, there is a tasting room now–I wish he still did it in the barn, though! I’m so glad you visited Unti, they are one of my favorites. Luckily, in Minnesota we can order from the winery. When the case comes, there’s always a personal note inside – what a nice touch!